If, after analysing the economic structure of society, I described capitalists from developed countries as polished devils, I would find it extremely difficult to find a suitable term for their counterparts in underdeveloped countries. Such capitalists are not satisfied with just sucking people’s blood, they often devour their flesh and bones as well; then they beat drums made from the skins of their victims as they deliver religious and philosophical discourses, build temples and construct lodgings for pilgrims (dharmsalas), and undertake various other activities. The words above are strong words but for those who know the story revealed by Greg Palast, Michael Hudson and others of how the current Global Economic Depression was deliberately planned by wealthy elites (economic terrorists) to create a global economic tyranny and a global police state, these words speak to the depths of our hearts where the flames of shame and rage are smouldering beneath the ashes of our blindness and our cowardice. We all know that every day, the future of this beautiful planet itself is being doomed further by the armies of corporate capitalist greed. And we all know that those responsible for the regime of economic tyranny and responsible for most of the misery of this planet are veritable demons in human form. We all have heard the endless statistics of economic inequality, poverty, malnutrition and we have all seen their victims on TV, the internet and newspapers. For example the Organization for Economic Development in October of 2014 has said that the world is facing the greatest economic inequality in health, education, inequality, the environment, and personal security in the last 200 years. This inequality is revealed in the 2014 Global Wealth Report of Credit Suisse Bank which reveals that 1% of the wealthiest people own 50% of the assets of the entire planet and that the bottom 50% of the population owns less than 1% of the world’s wealth. The report stated that in almost every country the top 1% of the wealthy elite owns from 100 to 1000 times the median amount of wealth. A stunning 95 percent of the world's population lost a share of its wealth over the past three years. Almost all of the gain went to the world's richest 1%. Inequality is a polite word for the wholesale robbery and misery of millions of people. We all know how so many “natural disasters” such as cyclones, floods, landslides are caused by human himsa against the environment. So no more facts, dialectical analyses or pictures are needed. We all know the truth no matter how we lie to ourselves. What is really needed is the blazing tenderness of love for all beings that drives us forth into action to deliver justice for every single one of them. Yet, by our continued failure to act we provide indulgence to corporate malevolence. Economics is a principal part of human life. To ignore it, is to damn the planet and its beautiful beings as it literally becomes a hell on earth. So what must a new economic order be based upon? Sarve bhadráńi pashyantu má kashcid duhkhamápnuyát. The Sanskrit word for this sacred “purpose” is “Artha”. “Artha” is also the Sanskrit word for “economics.” Shrii Sarkar has defined Artha as that which temporarily relieves, liberates and brings to an end all physical, psychic and spiritual bondages, afflictions and suffering. The basic theoretical understanding of this new science is elaborated in some detail in the book, What is Economics? What is clear however is that economics is by nature a libratory science and a revolutionary form of activity. Permanent relief from sorrow and suffering is only possible by Param-artha or the Supreme Liberation which comes from spiritual meditation whereby we fight and transcends our internal weaknesses and then merge our mind in Pure Consciousness deep within our own “I-feeling.” Due to the countless forms of suffering caused by malevolent exploiters human beings are too traumatized and degraded to pursue the path of spiritual liberation. Hence the path of economics, of liberating them from sorrow is the bounden duty of everyone. When we have a tyrannical economic system that has killed so many people directly or indirectly by enforcing through the IMF or EU or national economic policies that plunge millions into misery, the only way to create a humane economic structure is the path of economic revolution. In the socio-economic paradigm of PROUT, these movements are for the economic and cultural sovereignty of bioregions or samajas. When many people of a particular community are moving forward for a particular purpose, it is called samája (Samánamejati) – the community of people who have taken a vow to move together. The people of these samajas, have decided to move collectively hand in hand sharing the common joys and sorrows of life, struggling collectively against wrongs and injustices. Prout samajas have 2 aspects 1) destructive of the current exploitative economic order – at the district (bhukti) level 2) constructive of a new Prout economy via master units and networks of cooperatives – at the block (subdistrict, upabhukti) level. The main mission of Prout is to examine how the basic laws of justice are being violated in the daily lives of the common people. Above all the most fundamental form of justice is economic justice since without economic justice one cannot remain alive. If the government is failing to enforce these basic laws or if the government is enforcing an economic order that enforces economic exploitation and injustice then the duty of the Proutists is to establish and enforce basic justice by creating “pressure of circumstance.” This means that the Proutists will create a social, cultural and political environment that will either force the authorities to take action against exploiters or the Proutists will directly take action against exploiters. This can take the form of three approaches. This is the path of revolution that aims to destroy the existing network of economic exploitation throughout one’s district. This is the work of an entire network of communities (district) coordinating with other community networks (districts) in the socio-cultural region (samaja). This is a process that varies greatly in accordance with local conditions. However, we should mention that aside from removing outside exploiters another crucial task is removing foreign products that are preventing the growth of local industries. The dumping of cheap products in a poor country has been used by the UP (Holland), UK, USA and now China. The fight to stop the influx of foreign good is the key to establishing economic independence. ““So you must try to bring about an industrial revolution in the country. Just as there was a French Revolution, there should be an industrial revolution in Bengal. For this industrial revolution we must not depend upon raw materials from foreign countries. Remember that no country should depend on imported raw materials for development. Indigenous raw materials, that is, materials available within the country itself, must be used for this purpose. Those who love society – those who love the people of their country and are keen to bring about their socio-economic elevation – must think in terms of an industrial revolution based on the raw materials available in their own socio-economic unit. The districts of North Bengal – Coochbehar, Jalpaiguri, Darjeeling and West Dinajpur – can produce and supply enough raw materials for industrial development. We must utilize the available raw materials. For example, Coochbehar district can supply jute and tobacco; Jalpaiguri district can supply pineapple fibres; and western Jalpaiguri district can supply jute fibres. Malda district can supply mango; textiles; silk; rice bran for producing edible rice bran oil; and jute and maize which can be used to make paper. The Malda silk industry can successfully compete with Chinese and Japanese silk, but unfortunately Malda, which has so much industrial potential, is the third poorest district in Bengal. These things should be done, and they should be done in a short span of time. No industry in Bengal should depend on raw materials imported from outside. The main mission of this industrial revolution is to fulfill the basic needs of the local people. Aside from the basic needs for survival by increasing agricultural and industrial production, this in particular means the spread of educational institutions based on the local culture and with the mission of all round liberation of the people from exploitation and to foster their socio-spiritual enlightenment. The main way this is done is by creating networks of cooperative such as 1) Consumer’s cooperatives (Upabhokta Samgraham), 2) Producer’s cooperatives (Utpadaka Samgraham), 3) House Building cooperatives (Vastukara Samgraham), 4) Family Annuity (Insurance) cooperatives (Vipraya Trana Samgraham) 5) Cooperative Bank (Arthopayoga Samgraham) and 6) Service Cooperatives (Seva Samgraham). Creating networks of consumer cooperatives stores is also crucial so that the local people are not bound to the economic network of the exploiters. Housing cooperatives are also necessary not just to provide shelter for families but also for charity homes for those with special needs. In order for this to happen cooperative banks are required to provide credit and financing to cooperatives. Finally to free the community from the capitalist greed-based psychology various cultural cooperatives of artists, dramatists and musicians are required. Medical cooperatives are a part of this because holistic medicine is about changing the entire lifestyle and behavioural culture of the people. In every nation, the tale of exploitation of countless people is part of the vicious history of the “modern” world. The production of a community’s wealth is the heart of economic exploitation everywhere. Still today the stories of how, those who produce the world’s wealth are terrorized by exploitation and violence, continues being written in the sweat and blood of these victims and their descendants. That true history does not just cry out for justice, it damns those who consent to this economic himsa by their silence. A Production Revolution consists primarily of movements for Earth Democracy, Food Democracy and Ecological Democracy. The religions of most communities of the world during the Middle Ages were committed to aversion, hostility an animosity towards Nature and the communities of plants and animals. The crimes of human beings were used to justify rejecting, renouncing this world as an illusion or as a place of suffering. The religious leaders perpetuated the misery of the world by supporting various exploitative rulers and proclaiming them to be caliphs, living Buddhas, vicars of God (European kings) or descendants of gods like Vishnu. The rise of modern science eroded for a few centuries the religious beliefs but it accelerated the religious animosity towards the natural world. The history of the “modern world” has largely been nothing but a series of jihads or crusades against the natural world or Nature. The rise of modern knowledge about ecology has merely led to an increase in the destruction of lifeforms on this planet and an increase in hypocrisy. The collapse of the “modern” world of capitalist civilization has only accelerated the destruction of the environment. By contrast the indigenous spirituality of various tribes, adivasis, etc, is based not on the doctrine of the world as an abode of suffering or as an outright illusion such as found in Buddhism, Hinduism (Vedanta) and Christianity. Indigenous spirituality is based on a commitment to the world as an abode of Divine Bliss. So divinity is not to be found in so-called heaven, it is to be worked for and fought for here on this planet and other planets. Only in this way can one become a righteous or Dharmic or righteous person. It is only a Dharmic person who can attain true salvation by merging their mind in Pure Consciousness. 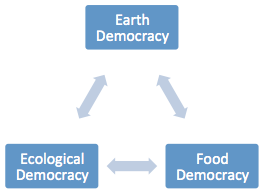 The movement to end the exploitation of the Earth and establish Earth Democracy is based on three crucial movements for economic democracy. 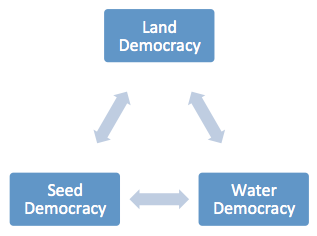 These are Land Democracy, Seed Democracy and Water Democracy. Water democracy includes irrigation as a basic human right. Land Democracy is the goal of all living beings. Birds, dogs, monkeys and humans all mark land as their own and all fight to control “their” land. None of these however behave with as much barbarism, with as much hypocrisy as human beings. The ideal of sharing all the land as one family is innate in every culture and was practiced to a great extent in hunter-gatherer societies. In modern times when thousands were driven from their lands by early capitalism, it was Thomas Spence who first said that the real rights of Man are not simply the political rights espoused by Thomas Paine but rather law in common ownership of the land and the provision of a basic income to all people. The crisis of the Global Economy in 2007 has led to what has been called “The Global Land Grab”. Africa as always is one of the main victims as in order to get hold over lucrative lands, western nations fund separatist and jihadi groups to cause civil war. Once nations become subservient they hand over more than 100,000 hectares to a western corporation who indulge in such destructive activities like mining. China also is active in this looting and part of the reason for the spread of jihadi groups is to create chaos that will make nations dependant on the US military (AFRICOM) and hence drive out the Chinese. At the same time due to Global Warming and due to destructive chemicals of modern farming, desertification is rapidly expanding. “In the first phase of the plan, those owning land which is productive as an economic holding need not be persuaded to join a cooperative. But if an economic holding comprises land which is dispersed in small plots, the scattered plots should be consolidated into one holding. Alternatively, wherever small, scattered, uneconomic plots are located, they will have to be joined together under cooperative management. Water Democracy is also something that has to be built up at the grassroots. The increasing desertification has led to increasing seizing of water resources from the local people as well as corporates taking over control of the water supply and indulging in price gouging. Large dams have had a disastrous effects on local ecologies and communities and also have shown to result in rapid silting such as seen in the Aswan Dam. In recent times we see how for example in Sikkim near every small river feeding the Teesta River is being dammed and the electricity is being sold outside the state. As the climate crisis intensifies so are these conflicts as the corporate sector becomes more desperate for quick profits and the environment ministry becomes their rubber stamp. This sets the stage for water wars between communities between states. Large-scale water wars such as between Israel and Lebanon have set the pattern for future wars. These wars play divide and rule amongst communities and mask the ultimate truth that unless there is democratic control over water resources at the grassroots level, the people will either be robbed of the blessings of these water bodies either directly or indirectly by pollution from factories and mines. Hence a coordinated movement for water democracy is crucial not just at the local and regional levels but also at national and international levels. Mobilization for river protection and for liberation for rivers from outside control is a key part of the movement for economic democracy. PROUT as always advocates a decentralized approach based on local district and block (sub-district) control over water resources. This includes the creation of small-scale networks of local irrigation systems based on small-scale dams. In addition PROUT has an extensive programme for water conservation including riverside afforestation, creating networks of large and small ponds to store rainwater as well as detailed information regarding the plants that will help these projects. This is the constructive approach for the water democracy movement. Seed Democracy is also crucial for Earth Democracy. It is when communities become independent of the capitalist economy by creating their own agriculture based on their own seeds that they become ripe for attack by the corporate and their media and their military. Vandana Shiva has pioneered the movement to stop corporate patenting of local seeds as their products. Dan Morgan has exposed the history of the 5 companies who control the grain of the world. William F Engdahl has exposed the conspiracy of corporations (like Monsanto) selling Genetically Modified (BT) seeds to enslave the world with their toxic products that have been shown to lead to cancer and psychological disorders. The ultimate reality is that unless the people control their own seeds they will increasingly fall prey to the corporate BT seeds that have severe side-effects and also bankrupt farmers. Farmers are divided by race, ethnicity, caste, religion but have to unite in order to liberate their samaja or bioregion. The samaja movement as a multidimensional movement embracing culture, spirituality and ecology alone can foster a new culture of deep unity based on service to the sacred soil of one’s homeland. Cereals have been instruments of power since ancient times. To centralize the production of cereal crops in order to maximize profits and control over the people has been the mission of every empire. The six corporations control the world’s grains supplies are Cargill, Continental, Louis Dreyfus, Bunge and Born, Andre and Archer Daniels Midland/Topfer are the offspring of the British Empire. Furthermore the price of grains that cause food crises and famines is controlled by speculators on grain futures in stock markets. In each nation, the national governments seize land from the indigenous peoples (adivasis) they destroy their traditions of using many different grains that are less destructive of the soil and often more healthy than the monoculture of wheat, corn and rice. The toxic pesticides that are part of growing cereals today have not only ruined the rivers and environment but have also led to increased levels of cancer. The organic or Agro-ecological movement is not enough to stop this. As the global land grab accelerates, more and more land is being seized and destroyed each year. The famous Kannada bhakti poet Kanaka Das wrote the Ramdhanyacaritre in which Ragi (finger millet – nutritious, coarse food of the poor) and Rice (food of the rich) ask the god Rama to judge who is superior and Ragi is judged the winner. Modern science agrees with this judgement. Crops like Ragi and jowar (sorghum) are being increasingly used not just due to their high nutrition but also due to the fact that they do not destroy the soil like water-intensive crops like rice. However, the fact is that the people are increasingly being forced not just to grow only rice and wheat but to grow BT grains like golden rice that have dangerous side-effects and unproven benefits. As more and more farmers face drought and as monsoon floods result in the polluting of land with river sands, it becomes clear that communities in a samaja (bioregion) must reclaim swaraj over their cereal production. This is part of the struggle for economic democracy. 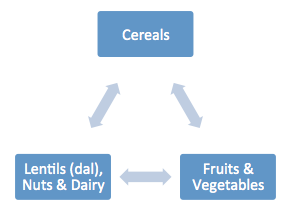 Lentils (dal), nuts and dairy are the fundamental proteins. Increasingly the production of these proteins is coming into corporate hands. However, even where there is not the case, we find local or national merchants raising prices by hoarding. When the pressure from the public becomes strong, the government launches raids on smaller merchants but lets the main hoarders escape the law. In addition there is the fact of chronic rotting of food in silos due to shoddy management as well as the illegal sales of food stocks by corrupt government officers. India as a result has severe malnutrition and stunting. The depriving of regular protein is one of the significant reasons for this. In such an emergency situation, direct action against the major hoarders is required to establish basic justice. This is part of the fight for Anna Azadi (community freedom to control its food supply). Fruits and vegetables are crucial to health. Yet in many countries not just fruits but even many vegetables have become food only the upper middle class can afford. Increasingly the right to food is becoming an international movement. However, it must be clear that people must have the right to afford fruits, milk and lentils on a daily basis. This fight for food democracy (Anna Ganatantra) is above all a fight to control the production of fruits and vegetables. Often fruits are exported leaving a small percentage for more wealthier local people. Furthermore the rampant use of pesticides banned in western nations makes the fruit toxic. The ultimate reality is that unless communities unite to seize control over the food production in their bioregion they face a grim future as climate change accelerates. Shrii Prabhat Ranjan Sarkar in the garden city of Ananda Nagar has created extensive plans for large-scale organic food production. To plan to replicate this in local areas is crucial at the same time while planning for revolution otherwise food crises may ensue. This is one way in which PROUT advocates not just a passionate physical revolution or even a spontaneous economic revolution (as seen in the Spanish Civil War) but rather a comprehensive economic revolution inspired the socio-cultural renaissance of Samaja movements. 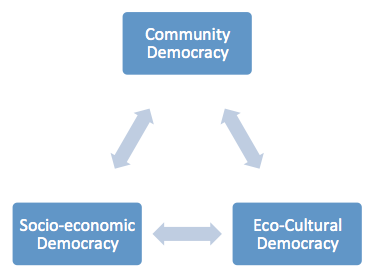 Ecological democracy means many different things. The original meaning came from environmental justice movements where local people victimized by corporate mining and industries asserted their rights to control the local ecology of their area. Later ecological democracy referred to the rights of the plants, animals and the Earth in a local area to remain free from human violence. Ecological democracy also refers to a future goal of an ecological society or a participatory society devoted to fostering the long-term ecological flourishing of all beings – both the so-called animate and inanimate. Finally there is an increasing revival of traditional (shamanism, paganism) spirituality rooted in worship of different natural entities. Shrii Prabhat Ranjan Sarkar, the founder of NeoHumanism noted that every living being has existential value which cannot be violated irrespective of its utility value to human beings. Second He stated that among the core values of a future World Bill of Rights would be the guarantee of complete security to all the plants and animals on the planet. He also mandated that training centres should be created to develop the minds and later spirituality of animals. He created the PCAP (Prevention of Cruelty to Plants and Animals) movement to create nature preserves (PASAKA) as well as to educate the public and stop crimes against animals and plants. Since NeoHumanism is rooted in mystical love (bhakti) and was created to protect this mystical love from the onslaught of narrow sentiments like nationalism, it has a very different approach to what is called sacred ecology. This is the ultimate goal of ecological democracy of Neohumanism not merely on this tiny planet but in the entire universe. 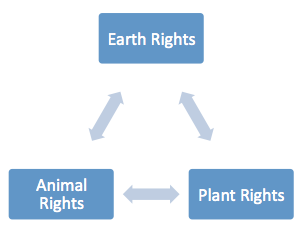 Earth rights is one of the most important development in modern times. The Universal Declaration of Rights of Mother Earth is one of the major documents of this movement. This was based on an Earth Rights amendment to the constitution of Bolivia. In this regard it should be mentioned that Shrii Sarkar was never a global thinker like many Gaian ecologists, rather He was a Cosmic thinker. Globalism can in a cosmic society be as dangerous as nationalism is today. Right now because human beings are confined to this planet we talk about the rights, the beauty and the divinity of this planet. However NeoHumanism gives equal importance to other celestial bodies, large and small, such as asteroids, suns, etc. Each of them has rights as well. Earth rights gives rights not just to the Earth as a whole but to each river, frozen tundra, hill and desert. In His 5018 songs, Shrii Sarkar has celebrated the divinity of even a dust particle. To acknowledge the rights of the landforms in one’s local area means that one has accepted one’s responsibility to serve and protect them. This is an essential part of economic revolution that is based not just on the idea of Annam Brahman (Food is the Supreme Cosnciousness) but of reverence for the Kśamáḿ Bhúmiḿ Bráhmańá Vávrdhánám (the Forgiving Earth that has grown and become manifest out of Pure Consciousness or Brahman – Atharva Veda XII.1.29). Plant rights refers to the rights of individual and groups of plants and not just to the rights of forests to exist. The right of even the most humble plant to survival and growth is one of the hallmarks of Shrii Sarkar. He devoted much of His time to collecting and distributing common as well as rare plants. In His songs, He revealed even the mystical feelings of plants. At the same time many new plant-based industries were revealed. It is the evolution of the human psyche by meditation that gives people the capacity to intuit and respond to the subtle expressions of plants. He noted that the development of this plant intuition is one reason why agriculture is part of the beauty of human culture. For this biodiversity mapping of all plant species and the spread of awareness about endangered species is crucial. While traditional education gave children a vast knowledge about different plants and teaches to reverence them, the present education system leaves one ignorant of them. The cultural movement that brings about the change in the collective psychology to develop sensitivity to the needs of plants is part of the bioregional (samaja) movements of PROUT. Animal rights also refers to the rights of individuals, communities and species of animals and birds to survive and thrive. Jason Hribal has shown that the rise of capitalism went hand in hand with the increasing exploitation of animals. Hence animals are the ultimate victims of capitalism which has developed high tech slaughter in western countries. PROUT is committed to ending the meat industry which is destroying our planet. In addition PROUT envisions strict laws protecting the rights of animals as well as their enforcement by government officials. The fight for animal rights in a bioregion (samaja) is one of the core activities of PROUT. As many have said the present relentless murder of animals and plants is akin to a war that capitalist greed is waging on this planet. In the emergence of economic democracy there must be clear laws and advocates advancing the safety and diversity of animal species. PROUT is an economy based on Consumption rather than on profit. What does this mean? Currently capitalists start enterprises where they believe they can make a profit. Governments bend over backwards to help them and to free them from serving the local communities (through taxes) and frees them from responsibility for any pollution. The end result is a race to the bottom as companies scour the globe searching for profits as the economy faces more and more crises. Large regions of the world are faced with stagnant or dying economies and environmental pollution. The basic fact is that this system is a form of violence – economic violence. Just as an abused woman often will not accept the basic fact that she is being abused and exploited out of fear, so also many in the global community have not accepted the obvious fact that the current economic system is not just a mafia network but simply a form of economic violence. Economics literally means the laws governing production for the welfare of the entire oikos (household community, including plants and animals). The present system of economic himsa does not function for the welfare of the global or local community and hence is the enemy of humanity. A consumption based economy is rooted in the needs of the oikos in the form of a block (sub-district, upabhukti) and a socio-cultural ecoregion (samaja). Based on collective study of the needs of a community, economic plans are made to meet those needs. These products are meant not only to fulfill the community’s material needs and desires but also their intellectual, cultural and spiritual needs and desires. This is a new branch of economics known as psycho-economics. Freud’s nephew, Edward Bernays created a new system of propaganda designed to create a consumer society based on materialism and cultural degradation. The primary goal of this system was to create artificial demand and desires for the consumption of the latest industrial products of corporations. PROUT aims rather to change production to meet the actual needs and desires of the local people. PROUT seeks to liberate people in all ways and enrich their lives with aesthetics and mysticism and the economy is oriented towards production to foster this type of consumption also. The economy has always been designed for the welfare of elites and it has undergone various stages of centralization from the local to regional to national and global levels. PROUT seeks to reverse this and build up economic sovereignty (swaraj) and democracy at the local level. This is the Consumption Revolution of PROUT. 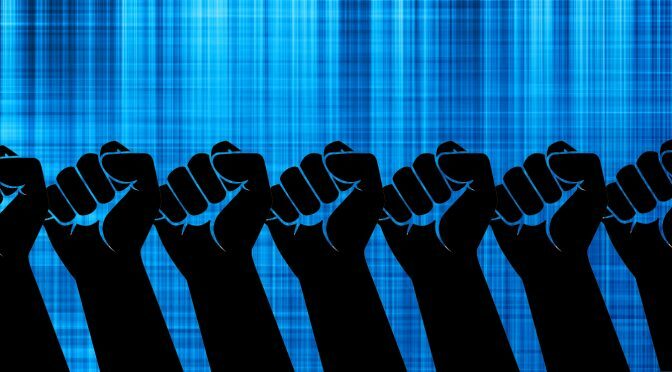 This Consumption Revolution is driven by movements for three forms of economic democracy: 1) Subsistence Democracy 2) Worker Democracy and 3) Industrial Democracy. The first and foremost aim of a PROUT economy is Subsistence Democracy. This means firstly that people should no longer be slaves of government handouts or the whims of a corporation. The control over the production and consumption of various essential products must be in the hands of the local people. This means also that the control of the various natural and other resources of the local area must be in the collective hands of the local people. This will guarantee their survival with dignity and eliminate extreme poverty. So much of the suffering in this world is that people have no economic security because of the struggle for survival. “People’s economy deals with the essential needs of the people in general – the production, distribution, marketing, shipping, storage, pricing, sales, freight charges, pro forma costing, and all related activities of such essential needs. Most importantly, it is directly concerned with the guaranteed provision of minimum requirements such as food, clothing, housing, medical treatment, education, transportation, energy and irrigation water. Continuous improvement in and ready availability of these requirements is the key factor in people’s economy. 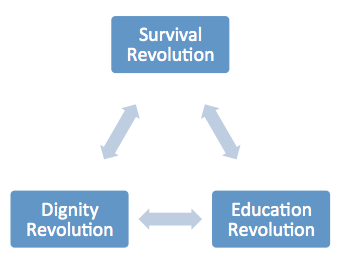 This comprises 1) a Survival Revolution 2) Education Revolution and Dignity Revolution. Survival Revolution involves providing people with enough nutritious food, water and medicine – creating an economic revolution to provide everyone these basic necessities in a decentralized way means mass industrialization (primarily of small-scale industries) of rural areas without destroying the environment. In order for this to happen control over all these products must be taken out of the hands of the capitalists and of their government netas. More and more people are being forced to realize that unless capitalism is destroyed their survival will become impossible. Thus revolution is becoming inevitable. This revolution not only involves taking over factories and throwing out local exploiters. It also involves careful planning about how to optimally utilize the local resources in an ecologically sustainable way to produce the basic goods for the people’s survival. Dignity Revolution involves providing people with the basic amenities that enable them to live in basic comfort in their society such as clothing, shelter, transportation (vehicle), communication (phone), etc.. More advanced amenities are required also to enable people to fulfill their dreams and their artistic, technical, cultural and spiritual talents. For example in certain cultures having musical instruments is essential to their daily life. The primary requirement for this revolution is to love and know each person in the community like one’s own child and plan for their all-round development. This is a collective activity that creates genuine societies. Preparing economic plans to produce such amenities is crucial to a subsistence revolution because subsistence must always be with dignity as part of human civilization. This is part of a new education system based on mystical universalism or NeoHumanism. The focus of NeoHumanistic Education lies in gaining all-round knowledge that enables one to liberate oneself and others and the capacity for all-round service to the community. To study the scripture of NeoHumanist Education one can consult Shrii Sarkar’s book Adorning the Dawn: Discourses on NeoHumanist Education. 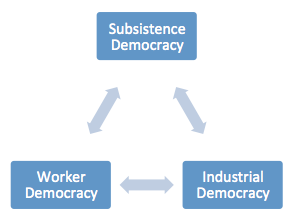 Industrial Democracy is a crucial aspect to Economic Revolution. Countless people are forced to migrate due to a lack of industries in their local area. Furthermore as soon as capitalists find a place where the workers are more repressed and where they will be able to exploit them more, they will abandon their existing industries and move, leaving the local workers unemployed. There is a vast mafia in smuggling workers in Asia and the Americas due to international exploitation whereby local economies in poor countries are destroyed by outside capitalists thus forcing the local people to migrate in search of work to support their families. When workers now arrive in the large cities they find that the modern system of factories has been largely dismantled and along with it benefits such as pension and basic labour system. Instead companies outsource parts of the industrial process to private dealers in the informal economy. These dealers choose different workers irregularly and hence do not give them any job security let alone any pension. In addition global slavery and bonded labour is expanding to cover more and more of the global economy. PROUT supports a balanced economy. For a perfectly balanced economic environment, it is required that not more than thirty to forty percent of the people should depend directly on agriculture, and about twenty percent on agro-industries, twenty percent on agrico-industries (pre-harvest industries), ten percent on general trade and commerce, and ten percent on intellectual or white collar jobs. If there is too much industrialization then the region or country will be forced to import agricultural products from other lands. The shortage of agricultural goods leads to unhealthy diets for the poor as well as the breakdown of families in the baneful atmosphere of urban slums. Furthermore due to overproduction of industrial products it will be forced to try to propagandize (through the media) or force other lands to import their goods. This economic violence (himsa) and imperialism will corrupt their culture and lead to social breakdown. Thus industrial balance is crucial. As per PROUT, the natural resources belong to the local people and thus any industries made from those resources also should be under the control of the local people. This is the root of industrial democracy. Moreover the functioning of the industries should also be under the supervision of the common people so that they are not the victim of destructive environmental practices. 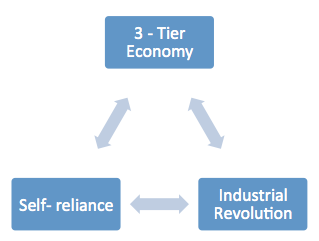 There are three primary components to creating Industrial democracy – the Three-Tier Economy, Industrial Revolution and Self-reliance. “A rural economy should not depend solely on cottage industries, otherwise the economic welfare of the rural population will be jeopardized. If cottage industries are properly organized, rural women will also get ample scope to earn a decent livelihood. Cooperatives and the local administration will have to take the responsibility of supplying cottage industries with raw materials so that they do not suffer from scarcity. The local administration will also have to arrange for the supply of sufficient power to facilitate industrial production. Every region in a socio-economic unit must strive to be self-sufficient in power generation. The local administration will have to supply locally generated power such as solar energy, thermal energy, bio-gas, hydroelectricity, nuclear energy, pneumatic energy, electromagnetic energy and tidal power, or any other power which is easily available locally. The generation of power is a key industry which should be run on a no profit, no loss basis so that the cost of production is minimized and the purchasing capacity of the people is increased. 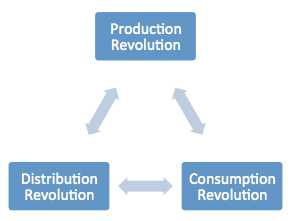 Industrial Revolution, as we have seen is a key aspect of PROUT’s economic revolution. In a discourse on creating economic self-sufficiency for Bengal, Shrii Sarkar mentioned firstly how in food production different parts of Bengal with unique enivironments can produced maximal amounts of the main forms of food such a rice, wheat, corn, lentils (dal). He then mentioned the different types of fabrics (cotton, types of silk, synthetic silk and plant fibres) that could be grown in different areas. He also mentioned different types of natural materials that can be used for construction of houses and automobiles. Unique materials were revealed to be useful for making paper and ink for schools. Additionally various plant and mineral medicines of various areas were discussed. Finally various novel cash crops and non-agricultural industries were discussed. In this way the blueprint for an economic revolution was given. Not content with such plans, he gave detailed plans for a vast garden city in the poorest district of West Bengal. As part of these plans were proposed many new agricultural and non-agricultural industries. The unique features of these plans is that they involve natural materials and are small-scale and dispersed widely throughout out areas of village agriculture. This is just a brief glimpse of PROUT’s mission for industrial revolution in every community. To organize collective planning for such industrial revolutions and fight the local exploiters who are hoarding the local resources is the main task. Self-Reliance is the ultimate goal at all levels from the agricultural to the cultural. All bioregions (samajas) have the potential to increase their plant and crop varieties by properly matching these with the soil, topography and climatic conditions etc. in their units. Reforestation can reclaim arid and semi-arid regions, and some unique plants like the Puranica or fern, which has the capacity to attract clouds, can help radically transform the rainfall and weather patterns of a region. An integrated approach to farming should include such areas as agriculture, horticulture, floriculture, sericulture, lac culture, apiculture, dairy farming, animal husbandry, irrigation, pisciculture, pest control, the proper use of fertilizers, cottage industries, energy production, research centres and water conservation. In addition in countries like India where the percentage of women directly involved in development is the smallest in Asia, empowering women to be economically independent will lead to a rapid expansion of economic development. Additionally where minorities are discriminated against there can be a system. Based on this an industrial revolution can be created. Agro- and agrico-industries based upon the productive potential of different plants can also help solve rural unemployment by creating a range of new goods and services. There are many dimensions to this revolutionary plant rationalization program, which is also a practical expression of the ideals of Neohumanism. Above all as part of samaja (socio-cultural ecoregional) development, the zeal has to be roused in the people to make their block, district and region independent not just economically but in the realm of education, culture and spirituality. This is all part of the building of self-respect of a community. “In olden days neglected and exploited people, who had fallen prostrate under extreme oppression, used to look upon Shiva as their supreme shelter. Shiva would crush this exploitation with His thunderbolt – He would strike the arrogance of vain and egotistic people with His trident, and reduce to ashes the mountains of injustice and tyranny. He felt great compassion for those afflicted people and, making them sit beside Him, advised them how to solve their physical, psychic and spiritual problems. Shiva used to live on a hill, and all kinds of people from far and near would flock to Him. He would call them with the call of His viśáńa, His long horn, and that is why the people of those days could not think of Him without His viśáńa – so they lovingly nicknamed Him “Viśáńaninádaka” [“One who Blows the Viśáńa”]. 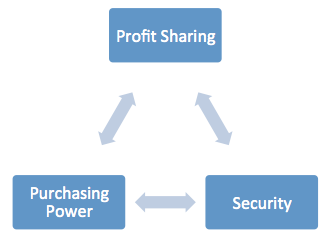 Profit Sharing: This is the heart of PROUT’s worker democracy. In general PROUT industrial cooperatives function like other cooperatives and the profit is shared amongst the workers depending upon the amount of labour and responsibility a person has. Furthermore all management positions are made by worker elections. PROUT stipulates that a worker’s shares cannot be passed on to family member, nor can shares be sold in the pivate stock markets. This is done to protect the cooperative from being taken over by capitalists. PROUT however wants these rights to profit sharing be extended to all workers and the economy to be taken over by cooperatives. Hence the mission for profit sharing is part of the fight for swaraj (sovereignty) over the local economy. In a country like India we see a dramatic rise in temporary labourers and the rapid decline of jobs with fixed hours and fixed income. This leaves women in particular vulnerable to extreme exploitation at low pay. Hence PROUT advocates the united struggle of all labourers not just to seize back their lost rights, nor to simply take over their workplaces but to create a new economy with new industries. This may seem like an impossible mission. However, in the current atmosphere of erosion of labour rights, rising unemployment and a second Global Economic Crisis, this kind of a freedom mission is in fact the only path to survival. Security: The most crucial fact about labour in the 21st century is insecurity. Even higher level white collar jobs (professors, analysts) are being contractualized. This helps the capitalist avoid paying pensions and renders the worker constantly insecure and less likely to protest any form of exploitation. Such workers are called “precariats” as their future is always precarious. The ideal system advocated by PROUT is that not only would a worker be guaranteed a job that gives enough revenue to afford food, water, clothing, housing, medical and education for his or her family. In addition PROUT advocates cooperative banks that would give workers access to credit without punitive interest rates and without investing worker money in the stock market like private banks do. Finally PROUT encourages the development of insurance cooperatives to provide all basic insurance needed by workers and their families. Above all we should say the aim of PROUT is not to simply provide material prosperity but to provide economic support for the intellectual, cultural development and above all spiritual enlightenment of every worker. This alone provides security and dignity. Purchasing Power: We have mentioned that purchasing power will be guaranteed to provide security for workers. As per PROUT, this right must be included in every constitution in clear, unequivocal languages. It is important to state that this is not the provision of a Basic Income. PROUT does not believe in workers becoming dependant on government handouts. Rather PROUT believes in workers taking over and creating their own economy. Thus purchasing power is a power given to a worker by the collective group of workers and not by a government bureaucrat. This purchasing power is part of the control that the workers collective exert over their local economy. Hence the goal is not to provide workers with a “basic” income to enable them to afford the minimum requirements for life but rather an expanding income that enables them as much as possible to thrive and enjoy the higher amenities of civilized living while at the same time having scope for intellectual and spiritual enlightenment. The very purpose of democracy is to ensure this. 1) The first requirement for economic democracy is that the minimum requirements of a particular age – including food, clothing, housing, education and medical treatment – must be guaranteed to all. Not only is this an individual right, it is also a collective necessity, because the easy availability of the minimum requirements will increase the all-round welfare of society. 6) The sixth requirement for economic democracy is the local people must be employed in local economic enterprises. Unless the local people are fully employed in the local economy, unemployment can never be solved. Local people should determine the quantum of minimum requirements and the basic policies connected with their own economic well-being. If this principle is followed the problem of outside interference in the local economy will not arise at all. 8) The eight principle of Economic Democracy is that Planning should function on various levels such as the block, district, state, national and global levels, but block-level planning will be the basic level of planning. Block-level planning is essential for economic decentralization, so it should be adopted in all blocks. There should be provision in the constitution for block-level planning for socio-economic development. The amount of natural and human resources varies from block to block; hence separate economic plans will have to be made for each and every block. There should be a block-level planning board in every block for this purpose. The block-level planning body will prepare a plan for the development of the block and accordingly implement the local developmental programmes. Above the block level there will be a district-level planning board. Thus, from the block level upwards, there will be planning boards to prepare and implement the local plans and programmes. It must be remembered that planning should be of ascending order, starting at the block level, and including all the levels of a socio-economic unit. Community democracy is comprised of three processes: 1) Political Power 2) Local Education & Culture and 3) Intra-district planning. Political Power is essential for community democracy. The principal goal of the administration at the district (bhukti) or sub-district (upabhukti) level or village (panchayat) level is to remove all the impediments and obstacles which prevent the economic needs of the people being met. One way to ensure this is Participatory Budgeting where the local community collectively plans the allocation of the budget along with the local officials and economic and ecological experts. This is organized through the networks of cooperatives. PROUT does not mandate a particular form of administration but rather allows for various types of administration as per the local culture and the needs of the local economy, It is based on this form of governance that samaja (ecoregional) governance takes place. It is to be note that the local administration is to be carried out by spiritual revolutionaries who have been acclaimed by the public for their service and sacrifice. This administration will also prevent any injustice by any individual, cooperative, village, block against others. Hence there is a check and balance system whereby the local administration exists to aid and facilitate the demands of the local economy but at the same time ensures swift action against any injustice. Such a vision gives rise to movements not just to develop local economic independence from outside exploiters but to take the local administration out of the hands of outside exploiters and mafias. Thus Prout’s economic revolution also involves a change in the local administration and the transformation of each area from being the victim of a capitalist-mafia controlled administration into a svatantra ksetra or liberated zone where the administration exists to serve the local people and their economy. Regarding higher levels of power, PROUT does not put emphasis on the “national” level which currently dominates political thought. Prout puts primary emphasis on the bioregional (samaja) and sub-district level in the realm of economics and at the level of the world government in the realm of politics. It is the dynamics of the creation of economic democracy and cultural renaissance in various bioregions (samajas) that leads to the merger of samajas or to a federation of samajas. The driving force behind this lies in the cultivation of mystical humanism (NeoHumanism) in each culture which enables each culture to flourish without any form of imperialism. This is why the diversity of cultures in a bioregion or in a national federation will only enhance their unity as one family. In this regard Shrii Sarkar has said that the entire South Asia and Southeast Asia would merge in future. Local Education & Culture is an important issue in PROUT. 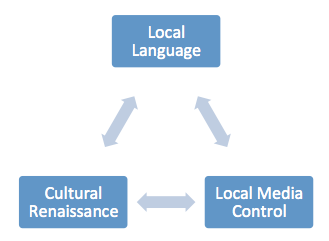 One important principle of samaja (socio-cultural bioregional) movements is that the medium of instruction from primary to tertiary level should be in the local language. As part of this also this education system should be decentralized as far as possible (to the district level at least) so that the local dialect and culture is made part of the curriculum. This is also important in case there are small languages which are spoken only in a few areas. As we have seen that psycho-economics exists to provide for the cultural and spiritual development of the local people. 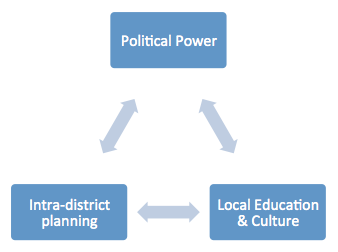 This is as far as possible to be managed at the district or even sub-district level. Sociological studies have shown that mysticism thrives in a decentralized environment. Hence PROUT (as a form of economics that fosters mysticism) strives for the local education and culture to be as decentralized as possible. This is the soul of community democracy. Intra-district (block, Upabhukti) planning is the foundation of PROUT. It itself is based on participatory planning at the village level but with currently, it is only at this sub-district level that it is possible to plan for maximum economic self-sufficiency and independence. This may not be completely possible since for example medicinal plants cannot be grown everywhere but missing items can be obtained by barter trade with other blocks of the bioregion (samaja) or if necessary another bioregion. This planning should include the following factors – the cost of production, productivity, purchasing capacity and collective necessity. Collective necessity refers to the basic physical needs of the people in the sub-district as well as the basic higher needs (educational and spiritual needs) of the people. As far as possible, planning is required to expand the variety of material goods and of different forms of culture and knowledge available to the local people. By learning how to plan for the higher needs of their community, the local people will develop great wisdom and motivation to themselves develop culturally, intellectually and spiritually. As is obvious the current demarcations of sub-districts (blocks) needs to be re-demarcated based on such factors as the physical features of the area (including river valleys, varying climatic conditions, topography, the nature of the soil, the type of flora and fauna, etc. ), the socio-economic requirements and problems of the people, and their cultural aspirations. With regard to economic planning there are four types of economic planning. The first is People’s Economic planning which involves planning for the rural and urban industries to meet the basic needs of the local people such as food, clothing, housing, medical care, electricity, transportation and education. Consultation with economists are required to deal with such issues as the production, distribution, marketing, shipping, storage, pricing, sales, freight charges, pro forma costing, and all related activities of the essential needs of the community – this is part of the commercial economy. Finally comprehensive planning of industries and sub-industries (providing) part also needs to be done by the local people in consultation with economists – this is part of the general economic planning. The fourth form of planning is Psycho-economic planning which we have already seen involves planning for the cultural, educational and spiritual development of the local people. Psycho economics also involves economic planning to support mass education about different forms of exploitation that the community faces, in particular about the cultural degradation and cultural imperialism of corporate pseudo-culture. “As you know, the mind has a natural tendency to degrade itself; it flows more easily downwards than upwards. So if some people, by virtue of their wealth, impose vulgar cinemas and dramas on others, this will break the latters’ spines and they will become paralysed. And those paralysed, spineless people will thenceforth never be able to stand unitedly against cultural or any other kind of exploitation. They will never be able to do so, because mentally they will be completely dead – their capacity to raise their heads in protest will have been crushed forever. How can they raise their heads again? “This exploitation in the cultural sphere is accomplished by the propagation of pseudo-culture. Every honest, virtuous, rational person must fight against this pseudo-culture, and inspire others to do the same. If this is not done, the future of humanity will be sealed. It is proper for human beings to struggle for political freedom, for social emancipation; but if their cultural backbone is broken, then all their struggles will end in nothing – like offering ghee into a fire that has died out. “What does mother tongue mean? That language in which we can freely, smoothly and spontaneously express our ideas in an unobstructed environment, just as we feel loving closeness with our own mother while in conversation, is our mother tongue. For example, a man in Purnia will talk to some of his close friends only in Angika language, not in any other language. There is plenty of controversy regarding dialects and theories. As the pioneering philologist of the 20th century, Shrii Sarkar has recommended that literature in all dialects should be collected. While as per standard practice, the most easily understood dialect can be made the standard dialect this dialect should take vocabulary from all dialects as well as local adivasi (indigenous) languages aside from adopting words from major languages like Sanskrit. Shrii Sarkar also have the eight signs of a truly independent language are 1) own vocabulary, 2) pronouns, 3) verb-endings, 4) case-endings, 5) oral or written literature, 6) style of intonation, 7) psycho-acoustic and inferential acoustic notes (phonosemantics), and 8) syntax. Local Media Control To be able to study, read newspapers, listen of the radio in one’s local language are fundamental cultural rights guaranteed in PROUT. This brings us to another important principle of samaja movements and that is that the local language should be the medium of communication in governmental, and non-governmental institutions and offices. This refers not just to the regional (samaja) language but to smaller languages as well. For example in a tribal or indigenous area, all members of the local administration would have to pass an exam in the tribal language. Furthermore official government notices should be in this language as well as the wider language of the samaja (socio-cultural bioregion). In order for the this to happen media democracy is essential. Local radio, TV, internet, mobile must as far as possible be in the hands of the local people of the region. This will ensure the voicing of local issues in the media. Right now the news of rural areas and in general of regions outside the wealthier and politically powerful areas simply is unreported. While there are many 24 hour news channels they all spew forth the same propaganda and do not report the crises that the local people are facing. This also leads to monoculture – or the imposition of corporate culture and fashions on an entire country. This renaissance does not just include books but also includes the development of local dance and music into forms of classical music through the introduction of mudras and ragas. This includes the development of local arts and crafts into fine arts. In addition various forms of folk drama should be developed and modern forms of drama should be introduced. In literature cultural renaissance includes the development of all forms of literature such as moral, yogic, mystical, nature as well as the various standard literary genres. This renaissance is driven by the mission of Ananda Parivara or the vision of all beings of the universe as part of one family. This leads to a relentless struggle against all forms of inequality and discrimination. Secondly it leads to the blossoming of all traditional art forms of the local civilization. Finally it leads to the acceptance of noble ideas from around the globe. Shrii Sarkar has not just given the manifesto of this mission in the treatise “Literature and the Practice of Art” but has also composed over 5000 songs. He has further laid the foundations for the renovation of all languages based on Sanskrit as the foundation for a cultural renaissance. This mission for a renaissance in the local language is a vast mission of several generations. We have very briefly mentioned a few points of this expansive mission above. 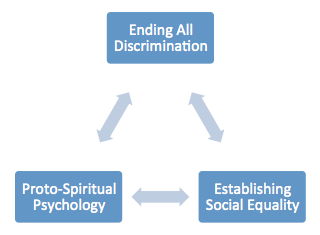 This movement towards socio-economic democracy is driven by three movements: 1) Ending All Discrimination 2) Establishing Social Equality and 3) Proto-Spiritual Psychology. Ending Discrimination is the very purpose of developing a society by an economic revolution. This is the basic difference between PROUT and liberal ideologies. PROUT aims to annihilate all forms of discrimination whereas liberal ideologies seek to reform and remove the harsh aspects of a society based on countless forms of discrimination. Liberal ideologies are fundamentally based on economic injustice and even economic counter-revolution and hence discrimination is bound to thrive – either openly or indirectly. In the physical realm there are five forms of disparities and discrimination in 1) Science 2) Social Progress (race, caste, patriarchy, speciesism) 3) Political 4) Economic 5) Culture (Including education). Science is a tool not just for exploitation but for enforcing discrimination. There are countless people who suffer from easily preventable diseases or even who live in poor conditions due lack of adequate technology at the local level. The very nature of science in the form of copyright is a form of criminality, because it rewards the exploitation of corporate science with absolute control not just over inventions but over Nature itself such as for example medicinal plants. The way in which the pharmaceutical companies deliberately raise the price on drugs for AIDS are essentially not just forms of enforcing discrimination but types of economic homicide. The essential part of any economic revolution is to take science out of the hands of the corporations and put under the control of autonomous institutions. Without this the lack of sharing of scientific knowledge will lead to continued exploitation and suffering. In the social realm we must make the commitment to wipe out once and for all such social discrimination based on race. We are seeing a global resurgence of racism and it must be fought in every country – especially those countries built upon racial exploitation and violence like the countries of Americas. Regarding caste Dr. Ambedkar remarked that, “Mahatmas come and go but untouchability remains the same. Caste is the very basis of economic exploitation in India, Pakistan, Nepal, Bangladesh and Sri Lanka and thus one cannot launch an economic revolution in these countries without fighting caste at the grassroots level and establishing a new economy based on intercaste marriage (between savarnas and dalits/adivasis) and social equality. Patriarchy is a disease that has become truly a global crisis after the Global Economic Crisis of 2007. Not only did violence against women rise dramatically, even in countries like the United State the culture turned hostile to women. The ultimate fact about all forms of social discrimination is that women are first and foremost the victims of these forms of venomous prejudice. Shrii Sarkar has warned that one reason for the increasing violence as our society becomes more and more technologically advanced is that our increasing violence against animals will lead to violence against humanity beings. As is well known, we are amidst the Sixth Greatest Extinction of innocent plants, animals and bird species on this planet. This is all due to the omnicidal or pervasive forms of slaughter of capitalist society today. While going to another planet may escape the problem temporarily we cannot afford to colonise and destroy planets the way in which the Aryans have colonized and destroyed North and South America. Stopping violence is the first stage of ending discrimination. The final stage however lies in the depths of the human mind. In the realm of politics we see that the exercise of power at various levels of administration is always a tool not just of exploitation but of discrimination. This is why tribes such as in Kenya will violently fight for an election – because democracy is not a form of governance but a form of exploitation by the ethnic group that wins the election. And the crux of all forms of political persecution lies in seizing the wealth of minority ethnic groups and in economically enslaving them. This is why an economic revolution is the key not just to economic freedom but to political freedom as well. Why is this so? One reason as Anthony Marx has shown is that Western nationalism was originally based on religious and ethnic cleansing. This is why as Michael Mann has shown, ethnic cleansing remains the dark side of western democracy. It is no surprise then that the export of western nationalism has led to the use of politics to perpetuate countless forms of exploitation and violence on various minority communities. This is why PROUT mandates the the local ethnic groups (such as tribes for example) must be guaranteed economic sovereignty as well as cultural rights in the local government administration. Furthermore PROUT is committed as we have seen to a cultural renaissance and cultural blending of all social groups on the basis of mystical love (loving the Supreme Beloved experienced in meditation in all beings). In the psychic realm the primary source of countless forms of discrimination, hatred, enimity is various forms of dogmas. Dogmas are primarily found in religions and this is why religions are the primary enemy of human unity. After the demise of communism, we have seen the rise of religious extremism as people have no alternative to global capitalist exploitation. Religions are based on (1) psycho-sentiment based on such weapons as: i) The propagation of stories, myths and parables to create superiority complexes; ii) The propagation of stories, myths and parables to create inferiority complexes and iii) The propagation of fear complex and inferiority complex amongst the people, especially the oppressed lower classes (such as lower castes). (2) physico-ritualistic observances which create a primitive collective force through collective rituals and (3) various traditions which become part of social life despite their irrationality. We must however clearly note that rigid doctrines such as the market fundamentalism of capitalism, the dogmas of communism, the dogmas of materialism in science and so on. Shrii Sarkar spent more time combating dogmas than capitalism because it is the dogmatic mind that readily becomes a victim of capitalism and participates in the victimization of other countries by imperialist capitalist exploitation. Shrii Sarkar noted that unless the intellectual utilizes his or her psychic energies for psychic and spiritual expansion, they will tend to use their psychic energies to suppress others. Establishing Social Equality is something that no economic or political system has taken seriously. The primary aim is either to remove serious disparities or as in the case of Pol Pot to establish equality barbarically by murderous slave labour camps. Social equality can only arise as a result of a social movement. This movement involves propagating the ideal of sama-samaja (society based on social equality) using the latest media and technology Secondly it is essential to propagate Tantra yoga which will people fight their crude states of Consciousness which give rise to a non-integral outlook that results in various prejudices developing in the mind. Third it is essential of propagate bhakti or mystical love in the local culture as it will enable people to realize their Supreme Beloved in the so-called inferior peoples despised by the local society. Fourth it is essential to arrange for the education (especially education in their rights as human beings and as communities), economic self-reliance of the persecuted sections of society and fight to increase their social status in society. Fifth these movements must culminate in the creation of strict laws to punish all forms of prejudice and to guarantee the rights and progress of persecuted committees. Finally people’s movements must strictly watch to make sure these laws are properly implement to give speedy justice to former victims of persecution. This new-born spirituality is like a flickering candle flame and hence is called proto-spirituality. This starts with the awakening of the higher levels of the mind. In this way we can realize how the evolution of socio-economic democracy or the generation of economic resources to end all forms of social equality based on such pernicious prejudices such caste, religion, etc. can truly establish an economic revolution. The genuine crisis facing every cooperative is the lack of morality and brotherhood/sisterhood amongst the members. This crisis can only be solved by this proto-spiritual approach to socio-economic democracy. As Shrii Sarkar once said, PROUT can only be implemented by those who are practically realizing the one Supreme Consciousness within all created beings. This is the start and the heart of PROUT’s economic revolution. In the beautiful city of Kingston, Jamaica on September 23rd, 1979, the Preceptor of social, economic, moral, cultural, political and spiritual revolution, Shrii Shrii Ánandamúrti concluded a Dharma Mahácakra discourse. Cakra refers to a cycle or matrix of energy, Mahán means tremendous grandeur and Dharma means righteousness attained by relentless fight against all evils in the mind and in the society. So Dharma Mahácakra means the tremendous grandeur of a matrix of energies of righteousness. This matrix of energies is created by a special spiritual blessing or Mudra. This word comes from the word “mud” means “joy, intoxication, delight, union” and the word “rá” means “to give, to bestow, to surrender”. To take the determination to see to it that not one single man, woman, child, plant, animal or the Earth itself will suffer the brutality of exploitation, discrimination and violence is in the blood of every Proutist. As we have seen, the very mission of economics is to liberate all beings from suffering. Hence to work, sacrifice and fight a revolution to materialize this mission is the real economic development and progress. Any person who has devoted their lives to this mission is unknowingly or knowingly a Proutist. The powerful dynamo of spiritual energies vibrating in these words empowered by the blessing of Lord Anandamurti will liberate not just this planet but this universe itself. Jamaica the land of the most heinous exploitation of the slave economy and the land of the revolutionary maroons led by Queen Nanny who fought guerilla warfare and defeated the British slave capitalism was the most perfect place on earth for the revelation of this blessing. This blessing and mission was given a year after Lord Anandamurti emerged after a fast of 1950 days in Jail. He was protesting His poisoning on February 12, 1973 and demanding a Judicial Enquiry. He fasted on two cups of yoghurt water daily so as to avoid being force-fed by the government. He was told by the Indian government intelligence (CBI) officials that if the propagation of PROUT ended, a luxurious ashram in the Himalayas would be provided for teaching yoga to wealthy elites. Facing betrayal and abandonment by disciples and family as well as imminent attempts at assassination, Lord Anandamurti boldly declared to the CBI that the Prout movement would emerge 16 times stronger. Namaskar. Dada most of your content is not accessible due to service unavailable problem. Please avail all the resources for God sake. It is pleased to you. Many thanks for your kind information. When we were checking the material is available. Please send us detailed information if you find that any material may be missing in future.